Kevin Durant has made it clear he doesn’t want to discuss the rumors that he’s going to sign with the Knicks this offseason, but that didn’t stop New York from fanning the flames this weekend. The Knicks included a picture of Durant standing next to rookie Mitchell Robinson as part of a pitch for season-ticket holders to renew for next season. The team deleted the photo after a Knicks season-ticket holder pointed it out on Twitter. The team released a statement shortly after. The rumors that KD with sign with the Knicks this offseason hit a tipping point last week when Durant ended his eight days of silence by blasting the media for pushing the narrative. 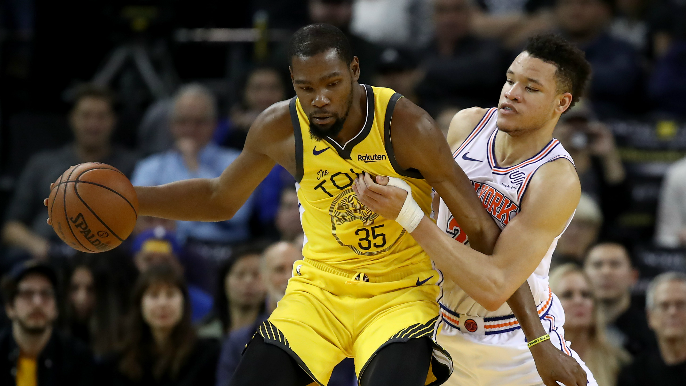 Many around the league have speculated that the Knicks’ desire to sign Durant, and belief that they will, was the catalyst for New York’s shocking decision to trade Kristaps Porzingis to the Dallas Mavericks. The Knicks will likely have a high pick in the 2019 NBA draft and project to have roughly $70 million in cap space this summer — enough for two max contracts.